The Amazon has a wealth of life richer than any place else on earth and two of the best places to see some of this incredible wildlife are at the Anavilhanas Jungle Lodge and the Uacari Lodge. The Anavilhanas Lodge, built with great sensitivity to the landscape and concern for the preservation of the environment, offers walking trails, bird watching tours, boat tours, jungle night treks and survival tours. This Lodge is a truly unique place, situated only one and a half hours drive from Manaus. 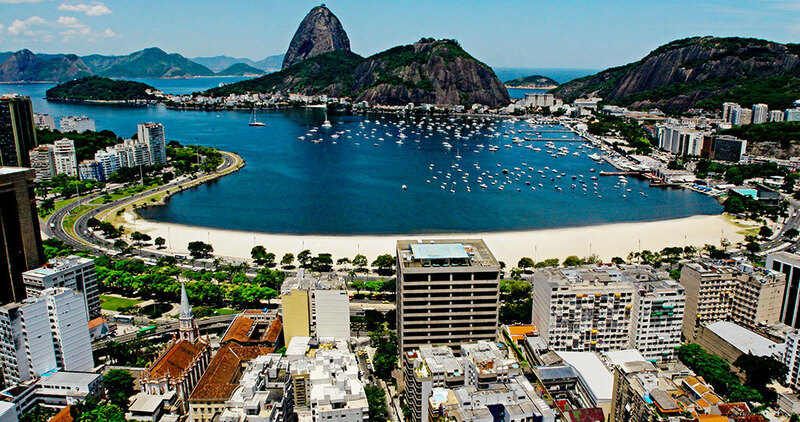 You will arrive in Rio de Janeiro and be met at the airport by a private driver who will take you to your Hotel. After checking in, you may want to relax and have some lunch. We suggest lunch at Porcão, a Brazilian barbecue buffet restaurant. In the afternoon you might like to take a wander around Copacabana and visit the famous beaches near your hotel. Today you will be taken by air-conditioned Land Rover on a city tour to visit some of the most famous sites of Rio. Driving on the scenic Castorina Road towards the Corcovado (the Christ statue) you will stop to see the Mesa do Imperador (the Emperor's Table) and the Vista Chinesa (Chinese Lookout point) before entering the Tijuca National Park. In the park you will visit the principal hotspots: the Taunay Waterfall, the Mayrink Chapel and not to mention the view of the beautiful flora and fauna of the forest and the sounds of the Atlantic Forest birds. Still driving through tranquil scenic roads in the Tijuca National Park, the tour will take you across the top of the mountain in the direction of Corcovado. After experiencing the panoramic 360º views from the top of the Corcovado, your next stop will be the neighborhood of Santa Tereza, a historical district of old Rio, where artisans and artists live and work. You will be able to visit authentic local artisan stores and have lunch in one of the local restaurants, where you will experience the flavors of Brazilian cuisine. After lunch you will visit the Chacara do Céu Museum, a special place where nature, panoramic views of the Guanabara Bay and art are in total harmony with the landscape. Ending your tour at the Sugar Loaf, where you will be able to watch the magnificent sunset over the city and the bay, you will no doubt have fallen in love with this enchanted city. We suggest dinner at Da Brambini (Italian seafood) in Praia do Leme. If you happen to be in Rio on a Sunday the hippie fair (open-air handcrafts market) at Praça Gen Osório in Ipanema is worth a visit. There is an evening dinner show (Samba show and dinner) also available. Please let us know if you would like us to book this for you. On your last day in the city of Rio de Janeiro you will check out of your Hotel after breakfast, after which you will be driven in a private, air-conditioned vehicle to your hotel in Buzios, (approximately a 3 hour trip) After checking in at your pousada your driver will take you on a tour of the beaches and you will discover how each beach has its own charm and why Buzios is so famous for its beautiful beaches. Praia do Canto, Praia da Armação dos Ossos and the lovely and intimate Azeda and Azedinha are the beaches which are closest to the "downtown" area, where the shops and restaurants are located. These beaches became famous worldwide because they are the beaches that Brigitte Bardot fell in love with when visiting the city in 1964, then a fishermen village. Driving along the peninsula is Praia de João Fernandes, and on the other side are the more secluded beaches of Forno, Brava and Ferradura. The longest beach is Geribá and one of the trendiest among the young crowd and surfers, with lots of cool kiosks that offer cold beverages and snacks. Tartaruga Beach is our last stop, which is where sea turtles lay their eggs, and is more protected from the strong winds. On your return to the pousada you may want to relax before having dinner. We suggest dinner at Satiricon (seafood). Today is free to relax and enjoy Buzios. You may want to visit one or more of your favorite beaches which you discovered yesterday, and perhaps take a walk around the village and visit the local boutiques and restaurants. Tonight our dinner suggestion is at the Italian pizzeria, Capricciosa. On the fifth day of your trip we suggest snorkeling in Tartaruga Small Bay. The bay is well known for its tranquil and turquoise waters and is the best snorkeling point on the Buzios coast. You are guaranteed to see a plethora of colorful fish and most probably some sea turtles. On the morning of your last day in Buzios a tour of Arraial do Cabo and Prainha Beach awaits you. This tour will be taken on your way back to Rio as it is en route. You will check out of your hotel and say goodbye to Buzios. Your driver will collect you and take you on your final tour. 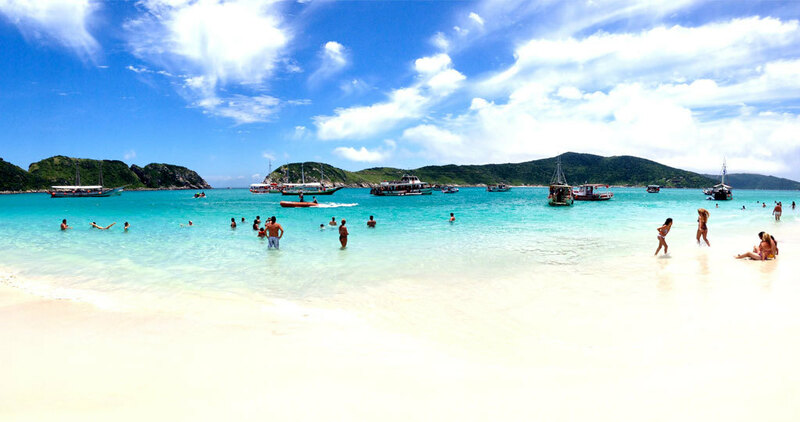 Every year Prainha Beach in Arraial do Cabo makes the top ten lists of the best beach destinations in Brazil. It lies in front of a channel that is surrounded by sand banks, turquoise water and beautiful white sand dunes, making it a favorite sailing and scuba-diving point. Just across from the beach is the small island of Cabo Frio, a Nature Reserve, that makes this place even more magical and appealing. Arraial do Cabo was a fisherman village that has evolved into a small city renowned for its fresh fish and pristine beaches. The tour will take no more than 2 hours. After the tour your driver will take you to the airport in Rio for your flight to Salvador. At the Salvador airport you will be met by one of our guides and driven to your hotel, where you will check in. We suggest dinner at the Lambreta Grill, an award winning seafood café. Today you will begin your journey through Salvador visiting the Pelourinho, the historical district of the city, followed by a delicious Bahian lunch. Then you will visit the Mercado Modelo in Cidade Baixa. The Mercado Modelo is a handcraft market that used to be the merchandise and slave-trading outpost of the city. Here you can buy many handicrafts and local products. Make sure you visit the catacombs below the market where the slaves were kept prior to sale. Today you will check out of your hotel and be transported by a private vehicle to Praia do Forte. The trip takes roughly an hour and when you arrive you will check into your hotel in Praia do Forte. We suggest having lunch at 'Bar do Souza'; try their delicious and famous 'bolinhos de peixe' (Bahian-style fish cakes) and/or a fish or shrimp moqueca (Bahian stew). After lunch we suggest you visit the TAMAR PROJECT (turtle NGO) Visitor Center and then on to Papa Gente's Natural Pools for snorkeling (times may vary due to the tide). It is now getting dark and you have worked up a hardy appetite so, we suggest having dinner at one of the many restaurants on main street. Today you will be taking an 8-hour nature tour. Begin by exploring the region of Sauipe, where you will take a 4-Wheeler Tour (1 adult per 4-wheeler) through Atlantic forest vegetation and along rivers. During the ride, there will be a stop at the Sauípe River for a swim and to go down the rapids on inner tubes. The 4-Wheeler Tour will be followed by lunch at the fisherman village of Diogo. Then you will take a canoe trip down the pristine river of Imbassai surrounded by snow-white dunes. You will explore nature in this unspoiled part of the world. Back at Praia do Forte; we suggest you have dinner in town followed by a stroll around the main street of the village and visit the shops and cafes. Today you may choose between one of 3 tours: Horseback riding, Sauipe River Catamaran or Sauipe Adventure Expedition. 3.5-hour horseback ride will begin by taking you through a lake, then along sand dunes, followed by a trail through tropical forest to the Castelo Garcia D'Avila and finally winding down and along the beach back to the village. 7 km Catamaran ride to the mouth of the River Sauipe, passing through beautiful areas of coastal rainforest vegetation and mangroves. A specialist guide will tell you about the various ecosystems and you will have the opportunity to swim and do a bit of bird watching. The Sauipe Expedition will take you on a hike through local wetland vegetation to the banks of the River Sauipe, where you will board native wooden canoes and row to the mouth of the river, with the help of a specialist guide. You will have a chance to enjoy a refreshing dip in the river or sea, before returning to your pousada in a 4x4 vehicle. The afternoon is free to relax and enjoy Praia do Forte. You may want to take this opportunity to visit the Castelo Garcia D'Avila, the impressive ruins of a castle belonging to the first land-owning farmer in Brazil. After breakfast you will check out of your hotel and be driven to the airport in Salvador. 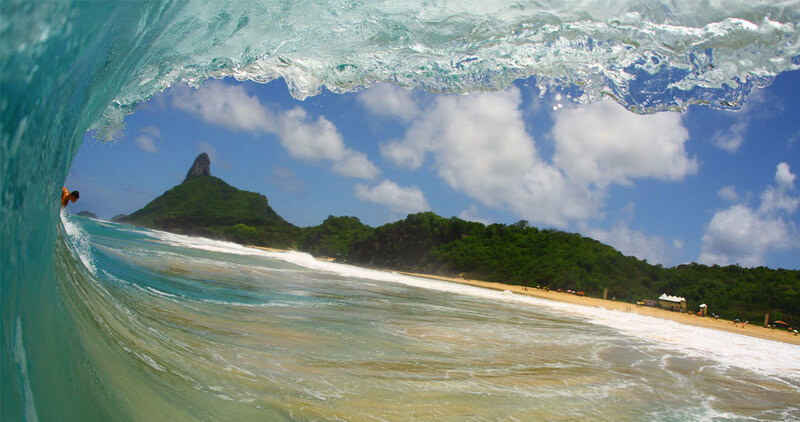 From here you need to take a plane to Recife (1 hour) and then to Fernando de Noronha (1 hour), where and English-speaking guide will meet you inside the Island tax paying area and then take you to your hotel. You will then be taken by your guide in your rented buggy on the island tour. This tour will show you the entire island, so that you can better explore your favorite sites the following days of your trip. We suggest you have dinner at a seafood restaurant near the port. After dinner, you will no doubt want to relax and prepare for day 2 of your Fernando de Noronha experience. On your second day on the island you will follow the Sancho Trekking Trail to see the dolphins returning to their resting bay in the morning. Then, in the afternoon you will be taken on a boat ride which covers the inner sea of the island. There is good chance of seeing the island's famous Spinner Dolphin as they depart their bay on their way to high sea for feeding. We recommend dinner around town. Today you will do the Acquasub tour in the morning. This is a snorkeling activity where you are slowly pulled behind a boat with other Snorkelers. It is designed to allow you to snorkel covering longer distances. It is an activity you must experience. The afternoon is free for you to relax and do what you want. Tonight why not try dinner at Pousada Zé Maria. It is famous for its delicious dishes designed by a Cordon Bleu chef. A 3-hour horseback ride awaits you this morning. You will be given a choice of a variety of trails, depending on your preference and your experience. The trails are either through mountains or along beaches. The afternoon is free. You might want to relax at your hotel, on the beach or go back and visit one of your favorite spots on the island in the rented buggy. On your last day on this beautiful island paradise you will go snorkeling with sea turtles at Sueste Beach. The tidal pools are clear turquoise blue and full of marine life. This is one of the few places where a colony of white sea urchins can be seen (the colony is located on the right side of the bay by the remains of the old port). We suggest you lunch at your pousada today, because shortly afterwards you will be picked up and taken to the airport. From Fernando de Noronha you will fly to Manaus, where you will be met by a representative of your Amazon Jungle Lodge at the airport and be taken to the lodge. After checking in at the lodge you will have dinner and be taken on a jungle night trek to see giant spiders and fluorescent fungus. Today's tour after breakfast is a jungle trek with emphasis on eco system by showing diversity of trees and plants. After lunch you will departure to one of survival camps where night will be spend and from where nocturnal trek is organized. After a delicious breakfast you will be taken on a full day Amazon River trip on canoe is boarded and you will visit the highlights that this region has to offer. Giant waterlilies, dolphin spotting for the gray and pink dolphins, bird watching, fishing on piranha and catfish completed with alligator spotting in the early evening. You will return to the lodge around 8.30 p.m.
After checking out of your Amazon Jungle Lodge you will be driven to the Manaus airport early in the morning to catch a flight to Tefe. At the airport in Tefe you will be met by one of the representatives from the Uakari Lodge and taken to the dock area and then in a speed boat to the Lodge. The boat journey lasts about one and a half hours. You will arrive at the Lodge just before lunch and will be given an orientation by the Uakari Lodge manager. After lunch at the Lodge you will have some time to relax and settle in before going on a tour in the afternoon. The tour will be either a walking trail to see wildlife in the flooded forest, or a canoe trip through the small tributaries to see wildlife along the banks of the rivers. You need to wake up early at around 6.30am to have breakfast at 7am. Your morning tour will set off at roughly 7.30am. This is the best time to see animals and also the temperature is cooler and therefore more amenable to do jungle tours. You will come back for lunch and then have a couple of hours after lunch to rest and prepare for the afternoon tour. There is a book and video library which you may use at liberty. The afternoon tour departs at roughly 3pm and returns at about 6pm. Supper is served in the main dining room and occasionally the researchers from the Mamiraua Institute will join. 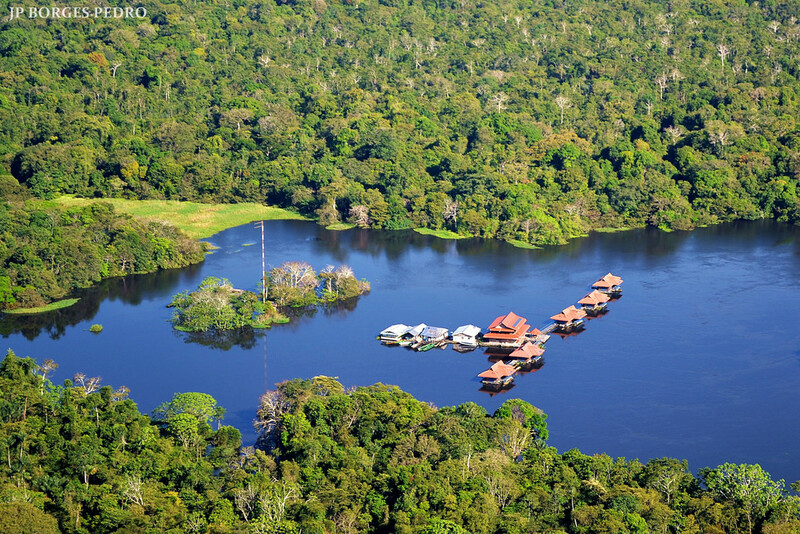 One of the evenings during your stay at the Lodge you will be shown a presentation of the flooded forest after dinner. During these 3 days the tours will be a variety of the following:Lake Mamiraua Trip - by motorized canoe to a beautiful lake inside the Reserve, where you will have an opportunity to see a plethora of birds, monkeys, pink dolphins, black caiman and perhaps the pirarucu fish. You will stay at the Lake until sunset and on your way back you will spot nocturnal fauna. During this night spotting you will be able to see various sized Caymans and if you are lucky small fish attracted by the lights will jump into the boat by the hundreds. Daily walks along one of the jungle trails in the company of experienced guides, to see capuchin monkeys, howlers, uakaris, squirrel monkeys, three toed sloths and hoatzin birds among many other species. Traditional native Indian harpoon fishing where, depending on how dedicated you are, you can expect to catch a variety of fish. Trip to visit a local riverine Caboclo" village in order to interact and get to know the Amazonian population and way of life. Paddling trips in dugout canoes where you will see a rich variety of birdlife and fauna. On your last day in this beautiful paradise you will you will be picked up and taken to the airport for your trip back home. We are certain that you will have enjoyed your trip and we look forward to seeing you again in Brazil.